I lived across the road in Kenry Street and studied at Tonypandy Primary school between 1965-1973. I have so many fond memories of my school days at ‘The Academy’ and I also spent many a happy hour in the yard playing football outside of educational hours! *Early years in the sand pit. *Discipline and total respect for the teachers, including a clip across the ear for any nonsense. *Concerts and St David’s Day celebrations. *The prehistoric heating system driven by coal from Boiler room. *Climbing the wall in the gap between the infants and the Kenry Street wall. *Getting on the roof to retrieve random soccer balls and getting that non dry paint on one’s hands. *Straddling the boys and the girls yard. *Rites of passage fights in the cloakroom. *Going swimming at Hendrecafn and doing a mile because you could not get out of the pool until you had achieved that goal! *Scoring my first goal in a football match. *Athletics, cricket and soccer in the yard plus gymnastics in the hall and trips up ‘The Mid’ for further sport. *The despair of the power cut, the snow and electricity going off at 17.45 every day – although we did have some time off school! *The traditional taking of the imaginary bus around the school with one of the kids who thought he was a double decker driver. *Mate being concussed running as fast as he could straight in to a wall plus much more is in my head forever – whether I like it or not! Innocence, that will never return at a school that will never return! There were the teachers who formed our values and the names of: Mrs. Pearce, Mrs. Cable, Mr. Ryan, Mr. Parry, Mrs. Jones, Miss Vaughan and Miss Lloyd trip off the tongue with head teachers such as Mr Deere and Mrs Davies also in the mix. The opportunity to go on to Tonypandy Grammar School also came from attending Pandy Juniors – although that meant a final judgement via a half day of drama at Bronllwyn (which resulted in among other things the weighing of self raising flour – and, that has come in handy! Ha!). *In April 1972 we were lucky enough to have a four day trip though England and France before staying in Belgium and Holland prior to a return. This was a major adventure for a school at the time and it is fondly remembered as well as being logged in the school records. There were those golden sessions up The Mid with Mr Ryan and as well as round ball activity there was the athletics and memories of the despatch i.e. bucket race (and that prized 3rd place certificate)! Meanwhile, in the hall the BAGA award gymnastics award for doing a forward roll or two was another coup! We were triers at sport and I recall beating Alaw 8–0 but losing 8-0 to Williamstown, winning comfortably against Gelli by 6-1 and also 3-1 against our SS Gabriel & Raphael neighbours but going down 4-0 to Penygraig and sadly others. That was us! We adapted the Chelsea FC tune and sang ‘Amber is the Colour’ as our football theme tune, but there were more defeats than victories. I also played Ali Baba in a school concert and it was a shortlived acting career but those curled up shoes shaped my feet for the rest of my days! Ha! Although appearances as the Archangel Gabriel and a man smoking a pipe also never pointed the way forward to adulthood! Ha! This famous Tonypandy educational outlet was in my life all day every day as when I was not in school I was looking straight at it from my childhood home, until I moved in 1983 -after 21 years of having Pandy Juniors in my daily gaze. Then in 2009 I actually worked at Pandy as part of the Only Boys Allowed boys literacy programme that preceded www.worldofwords.education and during that time I was given a full tour off all my old haunts from many years previously and that was an amazing insight. I still front the World of Words programme that has helped over 2500 children from 19 schools across ten years in RCT and that has also led to a strong well being element that has seen many families experience incredible free days our at major events thanks to the altruism of our project. I am very, very sorry to see the school closing and the ramifications of this decision are not good for Tonypandy or the kids of the area. 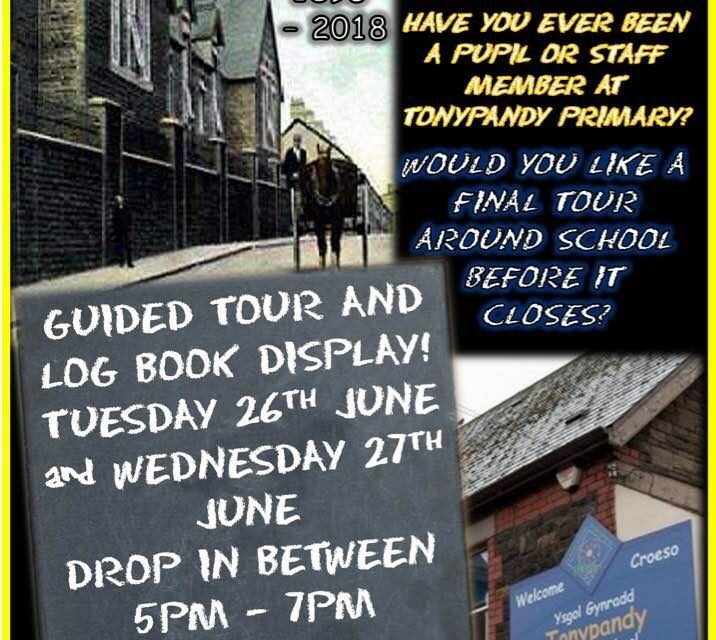 It is a fond farewell from yours truly – Tonypandy Primary School – you will never be forgotten and I am not alone as regards that sincere sentiment. I am still a Tonypandy resident and have a lot of affection for my youthful stamping grounds – meaning both the Primary and Grammar schools of Tonypandy. A legendary part of Pandy folklore will cease to exist in July 2018. Goodbye old pal– you will always be part of me……. Dynamics Fitness Suite open Day on Friday 10th January.